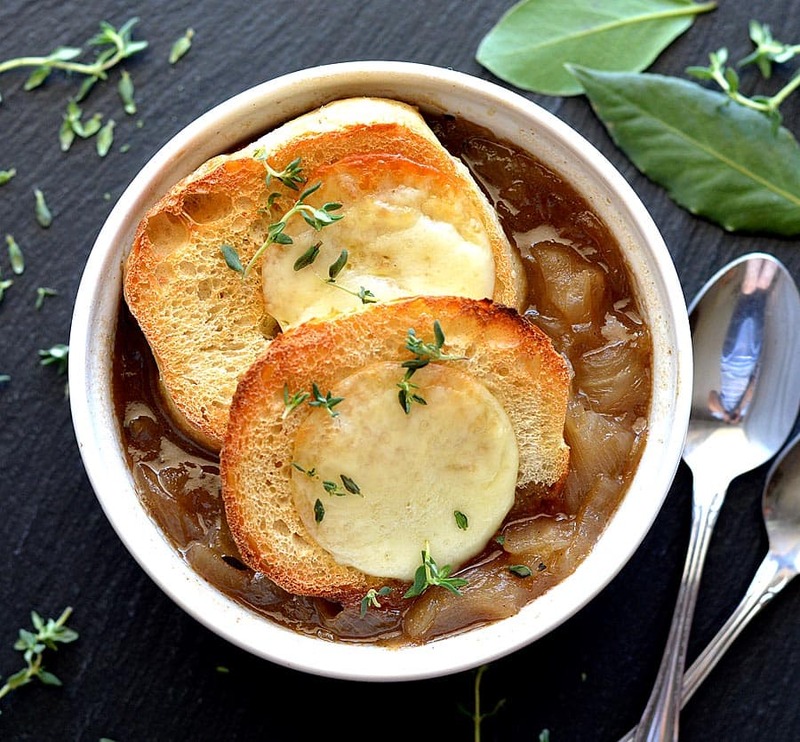 There were sooooo many requests for easy crock pot recipes when I asked you what you wanted to see and this Slow Cooker French Onion Soup is one of my favorites! Did I mention it’s also vegan? It’s true. The real flavor comes from slow cooking the onions to the point where they are caramelized and super sweet. Yum! In this recipe we’ll be substituting mushroom broth, which if you haven’t tried yet…you simply must! It’s so good, but sometimes a little challenging to find. I actually buy it at Walmart (by the case) or Whole Foods. However, if you can’t locate it, there’s always Amazon. The other vegan substitute I used was this vegan Provolone-style cheese. If you are vegetarian, feel free to use traditional cheese. Anything meltable will do. The onions are placed into the slow cooker with the vegan margarine, thyme and bay leaf. I like to add 1 Tbl of sugar which helps the onions caramelize. Cover and cook on high for 8 hours. After 8 hours, remove the thyme and bay leaf. Add the mushroom broth, vinegar, salt and pepper. Cook covered on high for 30 minutes. If you’d like to add the baguette and cheese slices, preheat your oven or toaster oven (<<<literally my favorite kitchen appliance of ALL time) to 350 degrees. Be sure your bowls are oven-safe! I toasted the bread first, then served up the soup, placing the bread and cheese on top. Back into the oven until the cheese is melted and golden. Serve immediately with a garnish of fresh thyme. Don’t want to wait for a slow-cooker? No worries! This recipe works great on the stove top too 🙂 In a large stock pot, add 1 Tbl oil and 2 Tbl margarine along with the onions, thyme and bay. Saute over high heat until golden and caramelized. Take care not to let the pan get too dry. I like to cover with the lid ajar, stirring occasionally. Don’t rush this process. The onions are the star of this show. They should be tender and juicy, not browned. The rest of the instructions are the same as the crock pot and the results are the same. It’s just a lot quicker. Make it ahead & freeze it! This recipe also lends itself well to freezing. I like to make a double batch and cool completely. Then, I divide the soup into 1 Cup portions, place in a freezer-safe bag and freeze. To be safe, do this one a plate just in case the bag leaks. Be sure they are sealed tight! To thaw…place the bag into a pan of water over medium heat until thawed or you can simply transfer to the refrigerator over night. To reheat leftovers…pour the soup into a saucepan and simmer over medium heat. About 10 minutes. Just ladle into bowls or ramekins, top with the bread and cheese and broil until the cheese is melted. If you'd like to add the baguette and cheese slices, preheat your oven or toaster oven to 350 degrees. Be sure your bowls are oven-safe! I toasted the bread first, then served up the soup, placing the bread and cheese on top. Back into the oven until the cheese is melted and golden. Serve immediately with a garnish of fresh thyme. « Plant Based Thanksgiving On a Budget with the 99! My son’s a diehard vegan since college, but I’ve had a hard time getting there, so I use your recipes to have many guilt free meals. 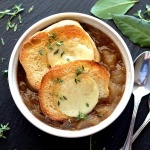 I just tried your French Onion Soup, and I did use the mushroom broth, which was hard to find but worth the search. Very good tip! Now I think I’ll try it in even more soups, the flavor’s so rich. I really enjoy your recipes and appreciate the way you’re very particular in describing the cooking phases, as I’m always afraid I’m going to ruin a dish because I’m so inexperienced at vegan cooking. When do you put the red wine vinegar in? ?